Revitalization of the Chenango Canal Summit Region began in 2001, when a Bouckville resident, on a walk with her grandchildren to feed the ducks on the water, discovered a stairway and footpath that were almost completely hidden by overgrowth. The stairway led to a hand-dug canal, built by the Irish and Scots from 1834-1837 and a towpath where the mules and horses walked while pulling the boats. 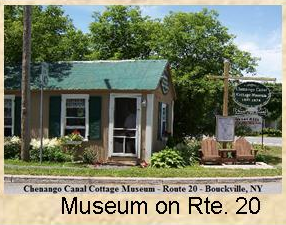 The Chenango Canal Cottage Museum was once a barbershop, but now serves as our tiny museum and meeting place. 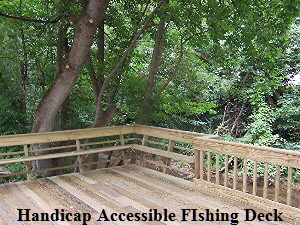 We have a handicapped-accessible fishing deck next to the museum on Route 20 in Bouckville, NY. See museum location. The Chenango Canal Towpath Trail was initiated by the Chenango Canal Association in 1994 to follow the original canal towpath, but had been abandoned because of the cost of liability insurance. Word got out, volunteers rolled up their sleeves and in 2001, the five-mile Chenango Canal Project was reborn as the Chenango Canal Association, Inc an approved 501 c 3 nonprofit. Summary articles about the Chenango Canal history.